The substrate preparation for planting Agaves is done as follows: mix equal amounts of garden soil, sand and broken brick /granite/ perlite. It is obligatory to sterilize the prepared substrate. You can do that by putting it in a microwave for 3minutes or in your oven for 45 minutes approximately. Previously prepared containers for planting are to be filled with substrate, but while doing it, be careful and leave some space at the top, at least 0.5 inches (2cm). Add plenty of water and leave the container, so that the water has some time to decant. Plant Agave seeds, but leave at least 0.4 inches (1cm) of space between each seed. Then cover the seeds again with a thin layer of substrate, and to finish it off, cover it with a thin layer of fine gravel, with grains no bigger than 0.12 inches (3mm). Water it again. Moisture is the most important part for seed germination. It’s best to cover the container with a piece of glass, nylon or a plastic bag in order to keep it moisturized. The container with seeds should be put somewhere warm, but not exposed to direct sunlight. The temperature needed for Agave to germinate is 77°F (25°C) and above. The germination can start as soon as 4 days after planting, but it’s more frequent for it to start after 10 days to 2 weeks. If it doesn’t start in 2 weeks, it will probably never germinate at all. Remove the glass that kept the container moisturized 2 weeks after planting. Agaves bred from the seed start off as one leaf. The empty shell of the seed can stay at the top of the plant for a long time. You can take it of gently by yourself, but it’s not necessary. You need to spray the substrate every day, it cannot be let to completely dry off. It is also important to provide the plant with sufficient sunlight during the day, but avoid direct sunlight for a couple of months. It’s of great importance for Agaves not to change its light regime during this sensitive period. Try to provide it with a similar amount of light every day. 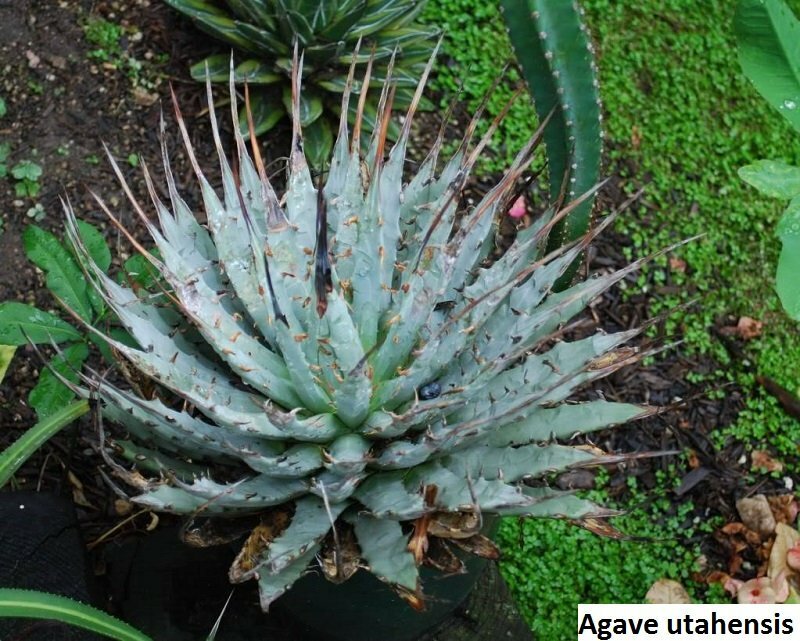 Agave’s seedlings have a tendency to fall over, which can be fatal for them. You can prevent that by adding some pebbles around the plants. The plant starts to form a new leaf four weeks after germination, so they start looking like mature Agaves. However, only after forming the third leaf will Agaves look more like their parents.